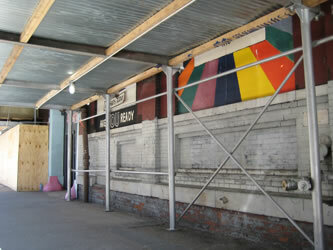 In late 2007, Triple Candie's landlord erected a sidewalk scaffold that partially eclipsed Triple Candie's temporary murals; Triple Candie was not notified about this in advance. This was the first "sign" that Triple Candie's facility was in jeopardy. When Triple Candie's staff contacted the landlord about raising the height of the scaffold so that the murals would still be visible, he told them that they would have to pay for the adjustment, which would cost thousands of dollars. In response, Triple Candie painted and installed this temporary sign on the scaffold's exterior. The sign, in effect, made it appear to the common passerby that the scaffold and construction were of Triple Candie's own doing -- that the space was undergoing a substantive renovation. 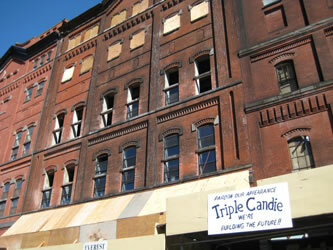 One month later, Triple Candie served notice to the landlord that it was vacating the space, which it did on April 30, 2008. As of the summer of 2010, the scaffolding was still in place.